Nestled in the foothills of the Appalachian Mountains in Northeast Alabama is one of our state’s best kept treasures; Choccolocco State Forest. Named for the Choccolocco Creek which runs through the valley, Choccolocco is rich in history, including Native Americans who settled the area 2500 years ago. Near the northern boundary of the mighty Creek nation, the tribe named the creek “Choccolocco.” In the Creek language “Chahko” means “shoals” and “lago” means “big. Choccolocco Creek is a wide shallow stream with big shoals, which runs north to south, roughly dividing the forest in half. Choccolocco Creek is one of the larger tributaries of the Coosa River. Located in south eastern Calhoun County, Choccolocco State Forest comprises approximately 4,406 acres of land with around 4,392 acres being in some type of forest cover. The remaining 14 acres consists of various openings. Four major paved roads cross Choccolocco. Alabama Highway 9 runs north-south through the eastern portion of the property and Choccolocco Road runs north-south on the west side of the forest. Joseph Springs Parkway and Bain’s Gap Road run east-west through the middle. Before the Indian removal of 1836, what is now Choccolocco State Forest was on the northern boundary of what belonged to the Creek Nation. Although there were white settlers before the removal of indigenous peoples, the area was officially opened to settlers by 1834 and what we know as the Choccolocco Valley was quickly settled. After decades of farming by the early settlers and their decedents, Choccolocco State Forest was purchased by the State of Alabama from private landowners during World War II. The area was used as a “corridor” for military access and training between Fort McClellan to the west and Talladega National Forest to the east. From WWII through the Vietnam era most of the property was leased to the United States Army and the Army National Guard and was utilized for training purposes. From then until 1994, the northwestern portion of Choccolocco State Forest was used heavily for military training which included small arms firing ranges, dummy mortar impact ranges and small unit tactical training. Some areas on the northwest portion of the property has considerable lead contamination in the soil and as a result, the Army continues to monitor the lead contamination with test wells. The management of Choccolocco was initially the responsibility of the Department of Conservation, Division of Forestry through their Dadeville district office. When the Alabama Forestry Commission was created in 1969, land management responsibilities was shared jointly between the Huntsville and Dadeville districts of the AFC. The Commission formed the State Lands Section in 1980 and a more intensive and systematic approach to all lands owned and managed by the Commission was initiated. From 1984 to 1994 a full-time forest technician oversaw and implemented the forest management plan on Choccolocco including timber sales, prescribed burning and other management objectives. After 1994 when that position ended, the management of the Choccolocco State Forest fell to the Northeast Region of the Alabama Forestry Commission. Owned by the State of Alabama, the management of the forest resources at Choccolocco State Forest falls to the Alabama Forestry Commission (AFC.) The working management plan for Choccolocco incorporates multi-use forest management concepts of the AFC’s Treasure Forest program. The primary management objective is timber, followed by wildlife, recreation, water quality and aesthetics. There are also several historical and environmentally sensitive areas on Choccolocco which are included in the management plan. Because many of the pine and hardwood stands had reached or passed biologic and economic maturity, most of Choccolocco State Forest has been harvested and replanted over the past several years. 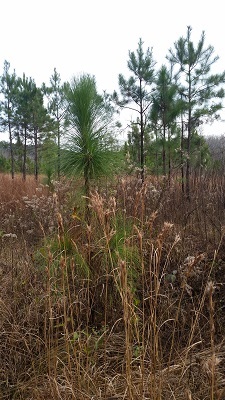 Silvicultural clearcuts were conducted, followed by chemical site preparation, and prescribed burning before re-planting with either loblolly or longleaf pines. After an extensive snowstorm damage in 1993, several areas of Choccolocco was replanted under the Global Re-Leaf Program. Areas affected were mechanically site prepared and planted with genetically improved loblolly pine. In 2016, 470 acres were planted with approximately 293,000 genetically improved longleaf and loblolly pine seedlings from the Arbor Day Foundation. To preserve biological diversity on Choccolocco, several areas of upland and bottomland hardwoods have been left. Clusters of mast-producing hardwoods have been left throughout the property. All silvicultural practices are conducted using recognized Best Management Practices for forestry to ensure the protection of local creeks, streams, and wetlands. Other management objectives will includes control or eradication of Chinese privet and kudzu. Extensive prescribed burning to help in the control of privet and kudzu, as well as reduce the buildup of forest fuels for protection in the event of a wildfire. Prescribed burning in addition, will help reduce hardwood understory helping with plant competition, enhancing visibility through the forest, and improving the aesthetic quality of the stand. Management of forest roads and fire breaks is also an important part of the plan on Choccolocco, including construction, repair and maintenance. An abundance of game and non-game wildlife species makes Choccolocco State Forest their home. Game species includes whitetail deer, turkey, rabbit, squirrel, quail and dove. Non-game species include native and migratory birds, fox, coyote, bats and many other mammals. One special wildlife area is the “Frog Pond.” Managed by the Jacksonville State Environmental Policy and Information Center. The Frog Pond Wildlife Preserve and Observation Area is located on a two-acre seasonal wetland located in the Choccolocco State Forest hear the community of White Plains. Jacksonville State University (JSU) uses the unique habitat as outdoor classrooms not only for college students, but for areas school children and the public. According to local lore, the “pond” was created from local logging practices during the early to mid-years of the last century. The site that is now a seasonal wetland, was the landing for local logging operations. The Alabama Department of Conservation and Natural Resources (DCNR), Division of Wildlife and Fresh Water Fisheries, through the Choccolocco Wildlife Management Area Wildlife Biologist, is responsible for the wildlife management on the forest. DCNR schedules hunting dates, plants and maintains several wildlife food plots and openings, and helps patrol the property for trespass violations. The unique beauty of Choccolocco State Forest provides many outdoor and educational opportunities. 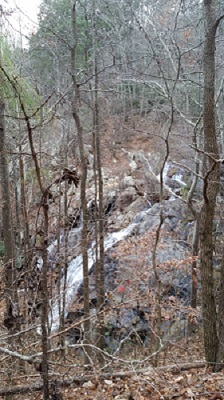 The waterfall area on Bain’s Gap Road includes a picnic pavilion and foot-bridge as well as a short walking trail. The area is also a historical site with the chimney remains of an old lodge. The many forest roads provide excellent opportunities for both biking and hiking trails, bird and wildlife watching, or just taking a short trip to enjoy the scenic mountains, secret coves and sparkling creeks and streams. There is an unimproved camping area for hunters on Joseph Springs Parkway, just west of the hunter’s check-in station. The Northeast Alabama Bicycle Club has established mountain bike trails throughout the forest. In addition to the trails, the many miles of interior forest roads are also used by bikers. The Alabama Forestry Commission utilizes the property for in-house training including equipment operation and prescribed burning.